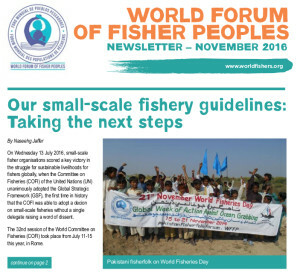 On November 21, 2016 the World Forum of Fisher People entered our 19th year of existence of fighting for the human rights of the world’s small-scale fishing communities. So, with this newsletter we want our members, allies and supporters to get ready for a new decade to take our struggle to greater heights. 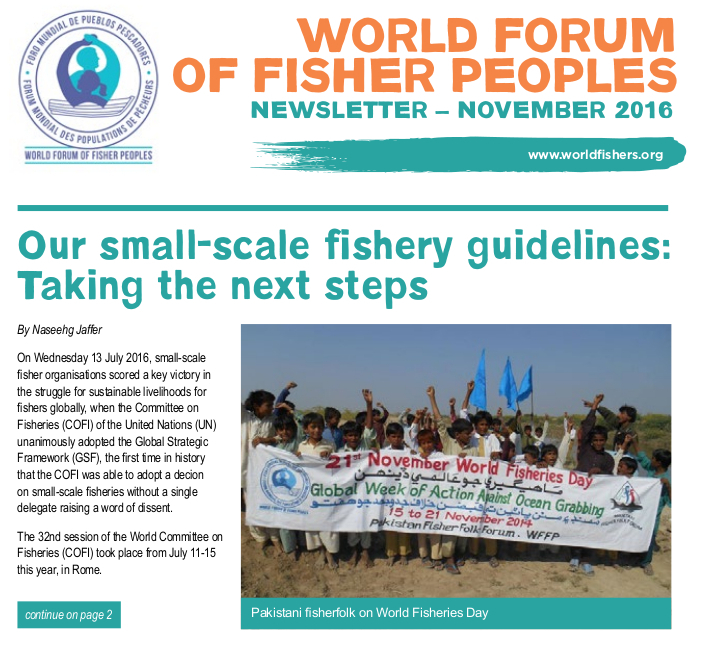 lack and tardiness to support the development of the small-scale fisheries sector. We have maintained good levels of organisation at national levels to sustain our struggle. Importantly we have achieved the adoption of the International small-scale fishery guidelines at the Committee of Fisheries at the Food and Agricultural Organisation (FAO) of the United Nations. Likewise, the adoption of the Tenure Guidelines at the World Committee on Food Security provides us with more tools that we can use to take our cause forward. Collectively we need to find ways to use these to help bring transformation in our sector that will lead to our protection and advancement. 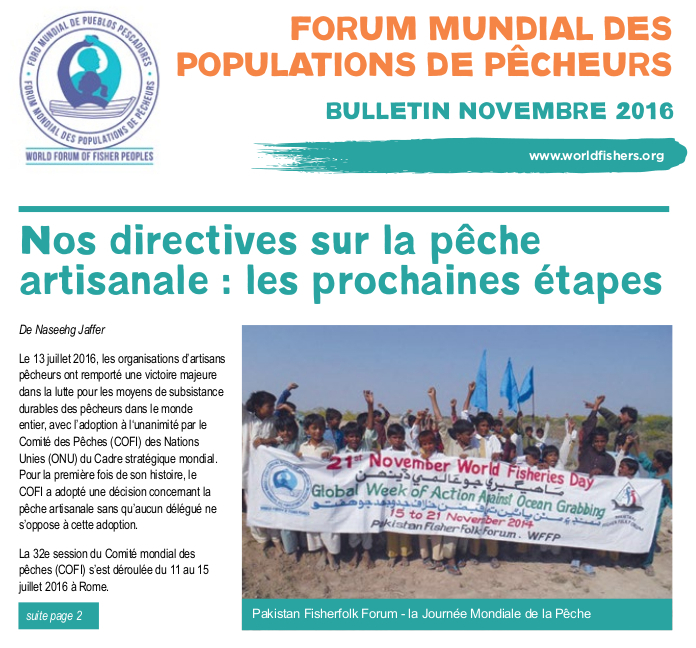 The WFFP Coordinating Committee has started a new way of working to help us enter this coming period. 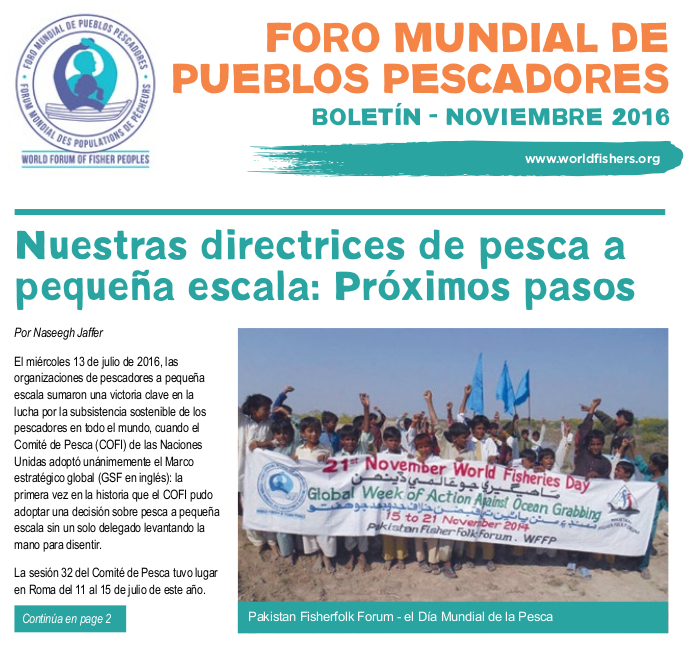 These include the formation of working groups on inland fishing, ocean grabbing and agroecology. We believe that this way of working will provide a few platforms for members and allies to help craft a programme of action for our national and global level work. We encourage all member organisations to volunteer to take part in any of these working groups. Please contact the secretariat via email in this regard. But we also need to improve the internal functioning of the WFFP and build a new generation of leadership that can take us forward in the long term. For this we need programmes to involve women and young people. We need concrete information sharing platforms of which this newsletter is a start. We will produce a couple more leading up to the next General Assembly in Delhi, November 2017. To build a stronger more active organisation, we need activists who can show dedication and resilience. We need fighters dedicated to do battle for the human rights in fishing communities. This is why we call on all WFFP members to become actively involved in the struggle. Importantly we also need to mobilise the Indigenous communities within our sector. Indigenous communities face a double whammy where their customary rights are violated and their fishing rights are taken away through privatisation. Such an intervention was agreed to at our last General Assembly and we need everybody’s help to give effect to it. Equally, we must encourage younger people in our communities to get involved. The youth are the leaders of the future. We must enable them to step up now.